Aphra Behn (14 December 1640? (baptismal date)–16 April 1689) was a British playwright, poet, translator and fiction writer from the Restoration era. As one of the first English women to earn her living by her writing, she broke cultural barriers and served as a literary role model for later generations of women authors. Rising from obscurity, she came to the notice of Charles II, who employed her as a spy in Antwerp. Upon her return to London and a probable brief stay in debtors' prison, she began writing for the stage. She belonged to a coterie of poets and famous libertines such as John Wilmot, Lord Rochester. She wrote under the pastoral pseudonym Astrea. During the turbulent political times of the Exclusion Crisis, she wrote an epilogue and prologue that brought her into legal trouble; she thereafter devoted most of her writing to prose genres and translations. A staunch supporter of the Stuart line, she declined an invitation from Bishop Burnet to write a welcoming poem to the new king William III. She died shortly after. 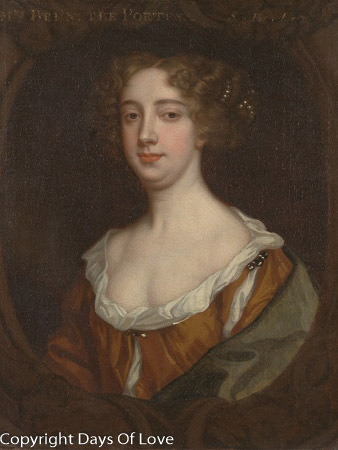 She is famously remembered in Virginia Woolf's A Room of One's Own: "All women together ought to let flowers fall upon the tomb of Aphra Behn which is, most scandalously but rather appropriately, in Westminster Abbey, for it was she who earned them the right to speak their minds." Her grave is not included in the Poets' Corner but lies in the East Cloister near the steps to the church. Behn became friends with notable writers of the day, including John Dryden, Elizabeth Barry, John Hoyle, Thomas Otway and Edward Ravenscroft, and was acknowledged as a part of the circle of the Earl of Rochester. Behn often used her writings to attack the parliamentary Whigs claiming, "In public spirits call’d, good o’ th' Commonwealth... So tho' by different ways the fever seize...in all ’tis one and the same mad disease." This was Behn's reproach to parliament which had denied the king funds. In her last four years, Behn's health began to fail, beset by poverty and debt, but she continued to write ferociously, though it became increasingly hard for her to hold a pen. In her final days, she wrote the translation of the final book of Abraham Cowley’s Six Books of Plants. She died on 16 April 1689, and was buried in the East Cloister Westminster Abbey. The inscription on her tombstone reads: "Here lies a Proof that Wit can never be Defence enough against Mortality." She was quoted as stating that she had led a "life dedicated to pleasure and poetry."